Those American Jewish groups and individuals who pushed for disinviting Republican Vice Presidential nominee Sarah Palin from a rally protesting Iranian President Ahmadinejad’s appearance at the UN effectively put partisan considerations above the effort to demonstrate wide and substantive American condemnation of the Holocaust-denying, genocide-promoting Iranian leader and his regime. This blot on a segment of the American Jewish community unfortunately has a pedigree: earlier instances, including during the Holocaust, in which some community leaders have, at critical junctures, given greater weight to party allegiances than to countering genocidal regimes pursuing the annihilation of Jews. It was hardly unreasonable that the Jewish organizations putting together the anti-Ahmadinejad rally would want to have leading figures from both major political parties speak at the event. But their plan went awry when Senator Hilary Clinton, on learning that Governor Palin would also be attending, withdrew from participation. Whatever Clinton’s reasons, her spokesperson’s claim that she took the step because the rally had become "a partisan political event" was perplexing, to say the least. The intent of the organizers, consistent with the arrangements prior to Clinton’s withdrawal, was clearly for a show of bi-partisan agreement regarding Ahmadinejad - in this instance, by the presence of the most prominent woman in each major party. But stranger still than the explanation offered by Senator Clinton’s office was the response of some American Jewish organizations. Perhaps one should not be surprised that the National Jewish Democratic Council (NJDC), an entity that exists to promote Jewish support for the Democrat Party, defended Clinton’s position. But, given the gravity of the issue at hand - protesting the leader of a regime that openly calls for the destruction of Israel, a regime that has in recent decades been the chief sponsor of anti-Jewish terror worldwide, and is aggressively pursuing the means to annihilate the Jewish state - the NJDC might at least be expected to do nothing to undermine the anti-Ahmadinejad rally. This would include not compromising the organizers seeking high-profile bi-partisan representation. The NJDC, using its excellent party connections, could have urged that another leading Democrat attend, perhaps even the presidential or vice-presidential candidate. Instead, in a statement released by its chairman, Marc R. Stanley, the NJDC called upon the rally organizers to "withdraw the invitation to Governor Sarah Palin," essentially giving priority to a partisan agenda - blocking the participation of the Republican vice-presidential candidate - over the goal of presenting the strongest possible statement of condemnation regarding a genocidal regime. A number of other Jewish organizational figures echoed the NJDC’s demands and the rally sponsors bowed to their pressure and acquiesced in disinviting Governor Palin and abandoning the goal of prominent bi-partisan participation. Earlier precedents, even during War World II, for the warped priorities demonstrated by the NJDC and those other groups and individuals have sadly been all too common. In November, 1942, information was released to the American media that some two million European Jews had been killed by the Nazis in what appeared to be a plan of total annihilation. American Jewish leaders sought to publicize the catastrophe and, with the help of prominent non-Jews, urged the government to take a number of steps that, if implemented, could have saved at least hundreds of thousands lives. But the government, in particular the State Department, consistently rejected and obstructed all rescue plans, and appeals to President Roosevelt to reverse Administration policy and initiate rescue efforts were to no avail. The Jewish leadership continued to lobby the government for a change of direction but refrained from strong public condemnations of Administration policy. In part, this reflected fear of triggering an anti-Semitic backlash, at a time when anti-Semitism was a ubiquitous fact of life in America. But the leadership’s reticence also reflected the loyalty of many Jewish leaders to Roosevelt and an unwillingness to confront publicly his refusal to aid Europe’s Jews. Government obstruction did not only entail refusing entry of Jews to America. State also blocked efforts to get Jews out of Europe to safe havens elsewhere. The most obvious place of refuge would have been Mandate Palestine, which, after World War I and dissolution of the Ottoman Empire, was controlled by Britain under a League of Nations Mandate calling for recreation of a Jewish homeland in the Jews’ ancestral home. Britain, from its receipt of the Mandate, repeatedly sought to undermine its provisions, most notably by blocking Jewish immigration. In the late 1930's, as Jews were desperate to leave Europe, Britain imposed even more draconian limits on Jewish access to the Mandate. The attitude of the British Foreign Office towards Europe’s Jews, even after learning of the Nazi extermination program, was reflected in communications with the State Department opposing rescue efforts and referring repeatedly to, in the words of one memo, "the difficulties of disposing of any considerable number of Jews should they be rescued." State Department policy converged with that of the Foreign Office, and appeals to Roosevelt continued to fall on deaf ears. When some leading figures in the Treasury Department, all non-Jews, learned of State’s policies of obstructing rescue, they were so appalled that they prepared for the Treasury Secretary a monograph entitled, "Report to the Secretary on the Acquiescence of This Government in the Murder of the Jews," and urged his confronting the President with the report. Roosevelt finally took some positive steps when faced with movement in Congress towards passage of a bi-partisan Rescue Resolution that would establish a rescue commission and support its operation in North Africa and neutral European nations. The Congressional measure was inspired by efforts of a group of Jews working outside the mainstream leadership, more aggressively publicizing Administration obstruction and actively seeking bi-partisan Congressional backing. With Congressional action looming, Roosevelt, in early 1944, created the War Refugee Board (WRB) to pursue rescue measures. While the Administration essentially refused to fund the Board - it operated mainly with private funding - and impeded its work in other ways, the dedicated staffs of the Board’s offices succeeded in facilitating the rescue of some 200,000 Jews. But many in the mainstream Jewish leadership opposed the more aggressive confronting of the Administration that led to creation of the Board. They did so, again, both out of fear of stimulating anti-Semitism and out of misplaced partisan loyalties. A notable example of the latter occurred in June, 1944. The Republican National Convention, meeting that month, included a strong pro-Zionist plank in its platform for the upcoming election and criticized Roosevelt for not pressing Britain to open Mandate Palestine to Jewish refugees. Rabbi Stephen Wise, the preeminent figure in the American Jewish leadership, had led mainstream efforts to promote rescue and had seen first-hand both the endless and pervasive obstructionism of the State Department and Roosevelt’s indifference and refusal to intervene. He could have used the Republican stance as an opportunity to press Roosevelt to match the Republican position and forge a bi-partisan policy of pushing Britain, then totally dependent on the United States, for a change in policy. Instead, Wise wrote to Roosevelt condemning as "unjust" the "reference to you in the Palestine Resolution by the Republican National Convention" and assuring him American Jews would share his view. Even in the face of the annihilation of European Jews, Wise could not put the desperate need to focus on all possible avenues of rescue above his partisan allegiance to the President. Today, the president of Iran at once insists the Holocaust never happened and promotes perpetration of another Holocaust through the destruction of Israel. That, despite Ahmadinejad's declarations and the policies of his government, some Jewish leaders, out of partisan considerations, still undermine efforts to confront in the strongest possible ways a regime promising a new genocide, is beyond shameful. For thirty years, the leftist Israeli organization Peace Now has been promoting the thesis that sufficient Israeli concessions would win the Jewish state peace from its Arab neighbors and that Israel’s refusal to make the needed concessions, primarily dismantling the settlements and returning to its pre-1967 armistice lines, are the main obstacle to that desired denouement. Peace Now has been arguing this line both at home and around the world and has attracted fervent overseas followers and media kudos for its stance. Earlier this year, as it celebrated its three-decade anniversary, the organization was found by the Israeli government to have violated Israeli law by using money ostensibly intended for an educational non-profit entity to fund instead political activities. According to The Jerusalem Post, the government finding meant, among other consequences, that the organization's American supporters would no longer be able to claim their donations as tax-deductible. Subsequent media reports have indicated additional, related malfeasance by Peace Now. But Peace Now's fraudulent casting of itself as an "educational" entity is not the fraud referred to in the above title. That reference is, rather, to the political program pushed by the organization over the past three decades. Peace Now came into being in the spring of 1978, about nine months after Menahem Begin had become Israel's prime minister and ended the Labor Zionist monopoly on control of the government. Labor's tenure had included the first ten years of Israel's post-Six Day War control over the West Bank and Gaza, the Sinai and the Golan Heights. Labor's policy with regard to ultimate disposition of the West Bank had been to pursue a division of the territory that would entail retaining key strategic areas while ceding to Arab control those regions that were home to the vast majority of Palestinian Arabs. UN Security Council Resolution 242, passed in the fall of 1967, declared that Israel should return captured land and withdraw to "secure and recognized" boundaries in exchange for peace, but it did not call for Israel to cede all the captured territory. On the contrary, the authors of Resolution 242 stated explicitly that they believed Israel should not retreat to its former lines. Lord Caradon, Britain's ambassador to the United Nations at the time and the person who introduced the resolution in the Security Council, observed some years later: "It would have been wrong to demand that Israel return to its positions of June 4, 1967, because those positions were undesirable and artificial. After all, they were just the places where the soldiers of each side happened to be on the day the fighting stopped in 1948. They were just armistice lines. That's why we didn't demand that the Israelis return to them, and I think we were right not to..."
The American ambassador to the UN at the time concurred, pointing out that "Israel's prior frontiers had proved to be notably insecure." And President Lyndon Johnson, shortly after the war, declared that Israel's return to its former lines would be "not a prescription for peace but for renewed hostilities." Johnson advocated new "recognized boundaries " that would provide "security against terror, destruction, and war." The division of the West Bank envisioned by Labor entailed Israel holding onto such key strategic regions - most of them sparsely populated - as the Jordan Valley, the heights overlooking the valley, some strategic heights dominating the coastal plain that is home to the bulk of Israel's population, areas around Jerusalem crucial to the defense of the city, and the Etzion bloc, while ceding the rest to Arab sovereignty. To reinforce Israel's claim to areas Labor sought to retain, the government pursued a policy of establishing "facts on the ground," the so-called "settlement" communities, in those areas. In the context of the Israeli-Egyptian peace accord which Likud Prime Minister Begin reached with Anwar Sadat in 1978, Israel agreed to negotiate an interim autonomy plan for the West Bank and Gaza, with autonomy succeeded by a permanent status arrangement to be hammered out by the parties during the interim period. Israel and Egypt subsequently engaged in a dialogue on setting up the autonomy plan. But the talks were condemned by all other Arab parties and ultimately ended without progress. However, Likud's official policy became pursuit of Arab autonomy in the West Bank under Israeli sovereignty. In fact, the differences between Labor and Likud supporters on disposition of the West Bank were not as dramatic as their parties’ ostensible positions suggested. Most notably, a division of the region along the lines proposed by Labor had the backing of a wide majority of Israelis, including many Likud voters. In addition, a 1984 poll asked those who favored Likud's vision of autonomy for the area under Israeli sovereignty whether, were autonomy impossible, they would prefer annexation or Labor-style territorial compromise. Fifty-two percent chose the latter; only 10 percent endorsed annexation. But while both major parties, along with the authors of Security Council Resolution 242, believed that Israel had to retain parts of the territories for its defense, and a large majority of Israelis supported pursuit of a compromise based on principles of maximal retention of strategic areas and maximal return of Palestinian Arab population to Arab sovereignty, the founders of Peace Now viewed the situation very differently. The organization's inception in the spring of 1978 was in the context of demonstrations against what its adherents perceived as Begin's not moving fast enough or being forthcoming enough in his negotiations with Sadat. But the organization formulated tenets concerning the Arab-Israeli conflict and disposition of the territories that transcended the Israeli-Egyptian talks. "Israel should stop all settlement in the occupied territories. Settlements are an impediment to peace and push the Arabs away from the negotiating table." There are a number of particularly notable aspects to these tenets. The government was, of course, negotiating on the basis of territories for peace, in keeping with UN Security Council Resolution 242. Why then did Peace Now make a point of this, unless it was really insisting that all territories be given up. That this was, in fact, the case is reinforced by the first item, which offers a false dichotomy. Indeed, the thinking in Labor since 1967, and of the authors of Resolution 242, had been that peace required some retention of territory by Israel and that a return to the pre-1967 lines would be incompatible with peace. Similarly, settlements had been established by Labor because it deemed retaining the settled areas vital to achieving an enforceable peace. Peace Now was articulating a blanket condemnation of settlements, which placed it at odds with Labor's strategic assessments and longstanding Labor policy. The Peace Now conviction that Israel’s Arab adversaries were now receptive to peace and Israel need only make sufficient concessions was not prompted by the recent opening of talks with Egypt. In fact, Egypt was vehemently condemned and ostracized by all other Arab states for its negotiations with Israel. The rest of the Arab League continued to adhere to the principles embraced in Khartoum in the wake of the 1967 war: "no negotiations, no recognition, no peace." The impetus to the Peace Now stance was essentially exhaustion with the ongoing Arab war against Israel and wishful thinking. Those attracted to the organization were people unwilling to reconcile themselves to the reality that Israel’s Arab adversaries were in control of deciding whether there would be peace, and that, with few exceptions, their decision, as demonstrated in words and deeds, was against Israel’s existence. The members of Peace Now instead embraced the delusion, and promoted to the wider Israeli and global public the fraud, that control of the situation was really in Israel's hands and that sufficient concessions would inexorably win peace. Peace Now's inverting of reality is dramatically illustrated by Bar-On in his introduction to his history of the Peace Movement. He declares that it is "a moral obligation - for Israel to resolve the hundred-year conflict with its Arab neighbors." The statement is remarkable for its lack of qualification. It does not say that it is Israel's moral obligation to be alert and responsive to changes of sentiment on the other side and possible opportunities for diminishing or resolving the conflict, or even that Israel must not only react to such potential opportunities but must actively explore for them and seek to promote them. Rather, it implies that Israel is capable by its own actions of bringing about peace and that if the conflict remains unresolved it is because Israel has failed to meet its moral obligation. Many figures in Peace Now pointed to the situation of the Palestinians in the administered territories as their reason for supporting the organization. Certainly, the Palestinian Arabs were living in ongoing political limbo, governed by a foreign state. (This was so even though a substantial portion of the bureaucrats in the territories were the same people who had held those positions under the Jordanians and who remained on Jordan's payroll. And Jordanian law continued in effect in the territories.) While Labor's position was that Israel had no choice but to await an Arab interlocutor - Jordan, in its view - who would negotiate peace with Israel in exchange for those areas the state could cede, many Peace Now advocates argued that the situation of governing an alien population was so corrosive to Israeli society that its continuation was intolerable. But even if there was merit to assertions that controlling Palestinian Arabs with no political resolution in sight had negative ramifications for Israeli society, that of course was irrelevant to Peace Now's other, bogus claims that peace with Israel's neighbors could be won by dismantling the settlements and offering to return essentially to the pre-1967 cease-fire lines. Consider how differently events would have unfolded, particularly over the last fifteen years, if those so concerned about disengaging from the Palestinians had not promoted Peace Now's fraudulent assertions and agenda. Imagine if, instead, perhaps under the banner of "Separation Now," they had argued that, yes, Israel had to retain defensible borders but, even though any political and military vacuum would almost inevitably be filled by hostile forces who would use evacuated territory as a base from which to attack Israel, it was nevertheless in Israel's interest - given the corrosive effects of the status quo - to withdraw unilaterally to those defensible borders and separate from the great majority of Palestinians. Of course, others would have argued that those advocating such a move were underestimating the toll a terror war waged from ceded areas would take on Israel. Not only would many people be killed, but vital national infrastructure would be vulnerable and damaged, the economy would suffer, immigration would diminish and emigration increase, and the nation would be put at profound risk. But at least there would then have been a national debate based on the realities of Israel's situation. Instead, under the banner of Peace Now, there ensued the apotheosis of a political agenda based on delusional, fraudulent distortions of reality, distortions that led directly to the Oslo debacle and all the bloody disasters that have flowed from Oslo. Peace Now's conviction of an Arab side readily offering peace if Israel would only make sufficient concessions ultimately degenerated into seeing in Yasser Arafat and his PLO the partner for its envisioned peace, and nothing Arafat and his cadres did could shake the organization from this conviction. For example, Peace Now embraced the declarations of the Palestine National Conference (PNC) meeting in Algiers in November, 1988, as the PLO definitively offering an olive branch to Israel, when in fact this was hardly the case. At the meeting, the PNC declared the establishment of the State of Palestine with Arafat as its President. It also proclaimed that it was doing so on the basis of UN Resolution 181. This was the General Assembly resolution in 1947 that called for the creation of two states in the Mandate, one Jewish and one Arab, and that the Palestinian Arabs had rejected at the time. Resolution 181 entailed for Israel territories that were much less, and much less viable, than Israel's pre-1967 domain. (In its regrouping and responding to the war waged against it in 1947-48 by the Palestinian Arabs and subsequently by the surrounding Arab states, Israel had gained control of additional land.) It was hardly a basis for negotiation now. But many involved with the Peace Movement hailed the PNC's Algiers declaration as implicitly recognizing Israel's right to exist. When, in the following month, Arafat, with obvious reluctance, acquiesced to American demands that he state unambiguously a renunciation of terrorism, a recognition of UN Security Council Resolutions 242 and 338, and acknowledgment of Israel's right to exist with peace and security, those within the Peace Movement embraced his doing so as additional proof of the rightness of their views and confirmation that a new era had indeed dawned. Were these steps by the Palestinian leadership worthy of note? Of course. Did it make sense for Israel to try to discern their significance? Again, of course. It was obviously in Israel's interest to learn if these moves represented a genuine new agenda, with new objectives, for the PLO. Or were they simply made in the context of the "plan of phases" (the agenda, articulated by the organization in 1974, of acquiring whatever territory could be gained by negotiations and then using that territory as a base from which to pursue Israel’s destruction)? Were they merely steps to win legitimacy and recognition by the United States without any intention of altering the PLO's revanchist and annihilationist goals? Or - a third possibility - were they something in between, perhaps representing a power struggle within the organization concerning which of two directions it should follow? But for the true believers of Peace Now, such questions, if considered at all, were quickly dismissed. In their eagerness to interpret evidence in conformity with their desires, they could see these events as only meaning that the PLO had indeed decided to pursue genuine peace and now all that was required was a reciprocal Israeli response. As the organization declared shortly after the PNC's Algiers conference: "In Algiers the PLO abandoned the path of rejection and the Palestinian Charter and adopted the path of political compromise..."
Counter-evidence included statements by PLO leaders, in communications with their constituents, of the organization's continued dedication to the PLO covenant and its focus on Israel's annihilation. But this was disregarded. An example of such statements was the declaration by senior PLO member Ahmad Sidqi Dajani on November 22, 1988 that, "We in the PLO make a clear distinction between covenants and political programs, whereby the former determine the permanent strategic line while the latter are tactical by nature. We would like some of our brothers to take note of this difference, that is, of our continued adherence to the Palestinian National Covenant." Another example was the comments of Arafat's second in command, Abu Iyad, some days later: "The borders of our state noted [by the PNC Algiers declaration] represent only a part of our national aspirations. We will strive to expand them so as to realize our ambition for the entire territory of Palestine." Similarly ignored by the true believers were Arafat's own assurances to his people of his steadfast allegiance to the "plan of phases," and evidence of continuing PLO involvement in terrorist attacks on Israel. Bar-On, in his 470-page history of the Peace Movement, much of it devoted to the peregrinations of the PLO, never even mentions Arafat's "plan of phases." Bar-On apparently did not want it to exist and so he simply ignored it. Peace Now’s predilection to fraudulent recasting of realities can be seen again in the organization’s response to Arafat’s embrace of Saddam Hussein following his invasion of Kuwait in 1990 and to the Palestinians’ wide endorsement of Arafat’s stance and of Saddam’s threat to "burn half of Israel." Some within the Peace Movement, invested in their own comprehension of Palestinian attitudes and aspirations, were, in Bar-On’s words, "profoundly disturbed and confused" by this rallying to Saddam. But Peace Now was undeterred from casting Israel as the obstacle to peace and Arafat as a ready partner if Israel would only treat him as such. The organization was soon attacking the government for its negative reaction to Arafat and the Palestinians’ allying with Saddam. It accused the government of seeking "to manipulate the political mistakes which the Palestinians and the PLO have made in order to advance" its own, insufficiently forthcoming, policies. Notable also in this statement is, of course, the whitewashing characterization of the actions of the PLO and its supporters as "political mistakes." It is a depiction reflecting Peace Now’s wish to blur the Palestinians’ eagerness for a Saddam-led war of annihilation against Israel into something less threatening and more in keeping with what the "peace" camp wanted to be the aspirations of the other side. "Political mistakes" suggested Arafat and his followers were in fact seeking a resolution of the conflict along the lines proposed by the Peace Movement but were simply going about pursuing it in the wrong way. Another illustration of Peace Now’s willful distortion of reality was its depiction of its Palestinian interlocutors, particularly those who were connected to the PLO but were not officially part of it and so did not fall under Israel’s ban at the time on Israeli contacts with the organization. Most notable among these interlocutors was Faisal Husseini. Speaking to an Arab audience in November, 1992, Husseini declared: "We have not conceded and will not surrender any of the existing commitments that have existed for more than 70 years...We have within our Palestinian and united Arab society the ability to deal with divided Israeli society...We must force Israeli society to cooperate... with our Arab society, and eventually to gradually dissolve the 'Zionist entity.'" He expressed similar sentiments on other occasions and, after the initiation of Oslo, he characterized the Oslo accords as the Palestinians’ Trojan Horse, its means of penetrating the Jewish state in advance of destroying it. In contrast, Bar-On, speaking of the period during which Hussein gave the speech just quoted, states, "A new generation of Palestinian leaders was emerging... Younger people like...Faisal Husseini...Most of the peace groups on the Israeli side maintained contacts with these new leaders and tried to persuade Israelis that these Palestinians could be partners in negotiations." As for those Israelis who were not persuaded, who took Arafat and his followers at their word when they declared their goal remained Israel’s annihilation, and who interpreted continued PLO involvement in anti-Israel terror as likewise weighing against its interest in genuine peace, the true believers of Peace Now had a ready explanation. Those benighted Israelis lacked sophistication, were insufficiently educated and often devoted to a narrow-minded religious traditionalism. Consequently, they were as yet unable to get past their biases, to look beyond the superficial and to recognize the Palestinian leadership’s genuine desire for peace. Bar-On, for example, notes that the Sephardic Jewish community in Israel tended to be more distrustful of Arab intentions and adds that this seemed, in surveys, to be related to educational level and level of religious traditionalism. He also makes the point that segments of the Ashkenazi community that were less educated and more traditional were likewise more distrustful of the possibilities for genuine peace than were Israel's elites. Bar-On concludes: "Higher learning, it is believed, exposes individuals to a wider variety of opinions, trains them in new analytical and flexible modes of thought, and enables them to relate to issues in a less emotional and more self-critical way, which leads to greater tolerance and understanding of the 'other' and of the complexity of the issues." Entirely missed by the "peace" activists in this comprehension was, of course, the narrow-mindedness of their own assumption that their interlocutors, and the Palestinians generally, must think as they do and subscribe to their values and perspectives. This assumption is another facet of their investment in the delusion, and their promotion of the fraud, that Israeli action will determine Arab action and that Israeli reform and concessions will inevitably yield the wished-for Arab response. Another tool used by the Peace Movement to promote its fraudulent agenda was Israel’s so-called New History. This refers to the largely bogus revisionist history that emerged mainly in the latter 1980's and whose purveyors generally advanced the thesis that Israel’s founding and early history, in particular its War of Independence, involved more egregious anti-Arab actions than had heretofore been acknowledged. The subtext, often explicitly declared in the work of the "new historians," is that if Israelis would only recognize their culpability, see themselves as bearing much responsibility for Arab hostility, and make the proper amends and concessions, then peace would be readily attainable. This extends to the lie in new historian claims of basing their arguments on newly released archives and so presenting a more informed view of the events they discuss. In fact, the sources cited by the new historians are typically long available ones, and what is most new in their presentations are their tortured use of those sources. One problem among the new historians noted by critics is their general failure to make significant use of available Arab sources and their presentation of Arab decision-making in very two-dimensional terms. Some critics have attributed this to these authors often not having sufficient command of Arabic. But a more basic explanation for the two-dimensional depiction of Arab decision-making is that this is consistent with the political intent of the new historians. Casting Arab actions as simply straightforward and predictable responses to Israeli actions rhetorically advances the thesis that Arab hostility should be understood as a consequence of Israeli provocations and that sufficient Israeli amends and concessions will inexorably elicit a positive response from Israel’s Arab neighbors. Another complementary development that has likewise been embraced, like the New History, by many within the Peace Movement, including within the ranks of Peace Now, has been what is widely characterized as "post-Zionism." The adherents of "post-Zionism" have essentially argued that the Jewish accoutrements of the Jewish state, even Israel’s overt self-characterization as a Jewish state, are offensive to Arab sensibilities and that more or less jettisoning these elements of national identity are among the self-reforms Israel should undertake to win the peace readily available for sufficient concessions. Advocates of post-Zionism have often cast their agenda of reforms as in the interest of "universalist" and "democratic" ideals. But others have explicitly declared that their enthusiasm for de-Judaizing Israel lay in the desire to appease its Arab adversaries. For example, shortly after the start of the Oslo process, David Grossman, one of the prominent Israeli literati associated with Peace Now, opined that, to see the process through to its fruition in peace, Israelis must concede to the Arabs not only geographic territories but territories of the soul. They must surrender their belief that it is of overriding importance for the Jewish people to have the military capacity to defend itself in its own land; the belief that the Holocaust was further evidence of the necessity of this; and the belief that the willingness of Israelis to sacrifice for the defense of the country, and to want to take an active role in that defense, is a virtue. They must also give up the belief that the creation of Israel represents a national return for the Jews from a long and too often horrifyingly painful exile. They must yield even their belief in the value of Jewish peoplehood. In this statement about the need for such concessions in the service of "peace," Grossman takes steps toward setting aside the lie that his and others’ advocacy of these steps simply reflects a high-minded devotion to "universalist" and "democratic" principles. But the statement still, of course, perpetuates another lie, the fraudulent assertion - based on exhaustion with the siege and a desperate and overwhelming desire for its end - that the right self-abnegations by Israel, the right mix of territorial and spiritual retreat, can win Israel the peace it desires no matter how much the objective evidence of words and deeds by the other side indicates otherwise. The Oslo accords marked the pinnacle of the Peace Now agenda. Israel embraced Arafat and his PLO as its peace partner and began the process of handing him control of Gaza and West Bank territories. Peace Now celebrated the accords and was silent in the face of declarations and actions by the Palestinian leadership that suggested an intention other than peace. For example, on the very night of the famous Rabin-Arafat handshake on the White House lawn in September, 1993, Arafat appeared on Jordanian television and told Palestinians and the wider Arab world that they should understand Oslo in terms of the PLO’s 1974 progam; that is, the "plan of phases." Arafat repeated his characterization of Oslo as the first phase in the "plan of phases" at least a dozen times within the first month of signing the initial accords, and he and his lieutenants did so many times thereafter. Arafat also repeatedly compared Oslo to the Treaty of Hudaibiya, which Mohammed had signed in 628 and abandoned when his forces became strong enough to overwhelm his adversaries. Peace Now's ignoring of such declarations was matched by its silence when Palestinian media, mosques and schools, under PLO control, incited their audiences, worshipers and students to hate Jews and dedicate themselves to Israel’s destruction. If Peace Now’s representatives broke their silence on Palestinian incitement, it was mainly to attack and condemn those Israelis who invoked such incitement as evidence that Israel’s partners were not interested in peace. Peace Now’s silence also extended to the terror that ensued upon the initiation of Oslo and to evidence of Arafat’s involvement in the terror. In the 22 months from Arafat’s arrival in the territories, in July, 1994, to the fall of the Labor-Meretz government that had initiated Oslo, in May, 1996, more than 150 lives were lost to anti-Israel terror. This far exceeded the toll in any comparable period in Israel’s history up to then. But Peace Now and its representatives continued to insist that Arafat and his PLO were offering Israel peace and that all that was needed were sufficient Israeli concessions. The terror was the major factor in Israel’s electing Bibi Netanyahu prime minister in the May, 1996 balloting. Netanyahu declared that Israel would make no further concessions until Arafat’s Palestinian Authority lived up to its earlier commitments to end anti-Israel incitement and terror as well as fight other Palestinian organizations engaged in terror. The Peace Movement's response to this stance was to characterize Netanyahu as obstructing progress towards "peace." "Hatred of Netanyahu enables us to conveniently forget that before the bubble burst, we acted like fools. We fooled ourselves with illusions. We were bedazzled into committing a collective act of messianic drunkenness. Hatred of Netanyahu also gives us a chance to forget that it was not the rise of Netanyahu that brought on the paralysis of Oslo but the paralysis of Oslo that brought on the rise of Netanyahu. The hatred permits us to keep harboring the notion that everything is really much more simple, that if we only pull back, if we only recognize Palestinian statehood... we would be able [once again] to breathe in that exhilarating, heady aroma of the end of history, the end of wars, the end of the conflict." But Shavit’s was a rare voice in the "peace" camp. As for Peace Now, it continued to insist that Israel had ready partners and that the obstacle to genuine peace was Israel’s failure to make sufficient concessions. Peace Now continued to hew to this fraudulent stance even in the wake of the July, 2000, Camp David negotiations and Arafat’s subsequent launch of a wide-scale terror war against Israel. At the talks, Ehud Barak, then prime minister, offered territorial concessions far beyond what commentators had thought any government would be willing to cede. More importantly, his offer far exceeded what virtually all military observers believed prudent, given Israel's strategic challenges. According to Dennis Ross, the Clinton Administration's chief negotiator for the Arab-Israeli conflict and a key participant at Camp David, Barak was prepared to transfer to Palestinian sovereignty some 91% of the West Bank as well as all of Gaza. This included all but a small sliver of the Jordan Valley and other territory long deemed by both Labor and Likud as vital to Israel's security and survival. In addition, Barak agreed to give some pre-1967 Israeli territory to the Palestinians. Israel also offered to cede parts of Jerusalem and even compromise its sovereignty in the Old City, including on the Temple Mount. The summit continued for two weeks. But, despite the dimensions of the Israeli offer and intense pressure from President Clinton, Arafat rejected the Israeli proposals. He did so without making any counter-offer on the territorial issues. In addition, Arafat demanded at the summit that Israel accede to the Palestinians' so-called "right of return," the claimed "right" of all Palestinian refugees from the 1947-48 war and their descendants not only to move to the nascent Palestinian state in ceded territories but to "return" to "homes" within Israel's pre-1967 lines. The admission of millions of Arabs to Israel would, of course, grossly alter the demographics of the state and is, in effect, a formula for the dismantling of Israel as the Jewish national home, the fulfillment of Jewish national self-determination. There is much evidence that Arafat did not go to Camp David with a view to actually negotiating with Barak. He knew Barak was determined to arrive at an end-of-conflict settlement, and Arafat had no intention of agreeing to this, no matter what Israeli concessions Barak offered. As Efraim Karsh has noted, "Had Barak not insisted on an end to the Palestinian-Israeli conflict, Arafat would have readily cashed in his concessions in return for further ambiguous pledges regarding a Palestinian-Israeli 'peace.' Yet there was absolutely no way for Arafat to [agree to a resolution of the conflict short of] the destruction of the state of Israel..."
Even Shlomo Ben-Ami, Barak's foreign minister, a leader of Israel's negotiating team at the Taba talks at the end of 2000 and still at that late date a fervent believer that sufficient Israeli concessions could win peace, conceded in June, 2001, that Arafat was only pretending to endorse a two-state solution but in fact still "doesn't accept the legitimacy" of Israel. 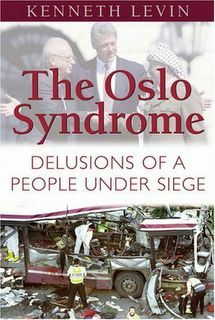 A few months later, Ben-Ami elaborated on his new insight: "For Arafat, Oslo was a sort of huge camouflage act behind which he was exercising political pressure and terror in varying proportion in order to undermine the very idea of two states for two peoples." But even in the wake of Arafat’s launching and continued prosecuting of his terror war, Peace Now persisted in promoting its fraudulent claims that the obstacle to peace was Israel’s wanting to hold onto some at least of the settlements and its refusal to make sufficient concessions. To this day, and despite the ongoing incitement to Israel’s annihilation by the media, mosques and schools of Mahmoud Abbas’s PA as well as by those of the Palestinian Islamist parties, most notably Hamas; and despite the terror launched both by elements of Abbas’s PA and the Islamist parties; and despite the refusal of all Palestinian parties to acknowledge the legitimacy of Israel as a Jewish state; Peace Now continues to insist that the obstacle to peace is the settlements. And, of course, despite UN Security Council Resolution 242 and despite all the strategic threats facing Israel, Peace Now continues to reject Israel’s having any legitimate claim on any part of the territories. Peace Now has promoted its fraudulent claims at great cost to Israel, including a cost in lives. But this has apparently been of little concern to the organization’s enthusiasts, an ugly truth that has not gone unnoticed by some in Israel. When, in the early months of his terror war, Arafat had his cadres particularly target settlers, Ari Shavit observed: "On almost a daily basis, Israeli citizens who live beyond the Green Line are being murdered by the historic allies of the Israeli peace movement, yet the movement is silent... It is a blood-chilling silence and it raises the question whether... what has been presented here as the hallowed value of universalism was not in fact only an extremely particularist value that was intended to serve the specific needs of a specific cult of enlightened human beings." It was and is a cult that worships at the altar of self-delusion and wishful thinking and that, intoxicated with its airy visions of "peace," was and is prepared to sacrifice anyone who challenges it, no matter what evidence, what realities, he or she invokes in that challenge. It was and is a cult that has demonstrated it is willing to sacrifice even the security of the nation on the altar of its delusions and its delusion-driven, fraudulent claims. That was Peace Now at its inception and it is Peace Now at 30.